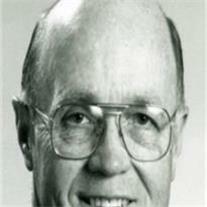 John Hubert Lyons, beloved husband, father and grandfather, passed away on September 3, 2009. John was born in Ardmore, Oklahoma, on February 8, 1936, to Hubert Wilson and Mary Margaret Lyons. He grew up in Penn Wynne, Pennsylvania, graduated from West Chester State Teacher’s College, and spent a year teaching music in New Jersey. In 1957, he met his lifelong and eternal companion, Marlene Wade, while both worked at the North Rim of the Grand Canyon. After marrying in 1958, they lived in New Jersey and Virginia while John served in the United States Army Signal Corps. In 1962, they moved to Arizona, where John attended the University of Arizona College of Law. John practiced law in the Phoenix area for nearly 40 years. His service as chairman of the Arizona State Bar Ethics Committee exemplified him as an attorney, and in all other aspects of his life. His singular integrity and professionalism added greatly to the clients he served and the lawyers with and against whom he litigated. With Marlene, John was a devoted member of the Church of Jesus Christ of Latter-day Saints. He was blessed to have served in various positions throughout the Phoenix area, in northern Arizona, the Philippines, where he served as president of the San Fernando Mission, and Russia. He will also be remembered for his temple service. John’s tireless devotion to his Savior and to his fellow man brought immeasurable joy into the lives of all those fortunate to have known him. John is survived by the love of his life, Marlene; son Michael (Shari); daughter Suzanne Rauch; son Richard (Darlene); six grandchildren; and his sister, Robin Puckett. He will be greatly missed. In lieu of flowers, donations may be made in memory of John H. Lyons to the Perpetual Education Fund of the Church of Jesus Christ of Latter-day Saints at http://www.ldsphilanthropies.org/perpetual-education-fund/. There will be a visitation Wednesday, September 9, 2009 from 6-8 PM at the LDS Lakeside Ward, 1005 N. Voyager Dr. in Gilbert. Funeral services will be at the same location Thursday, September 10, 2009 at 10:00 AM preceded by a second visitation at 9:00 AM. Arrangements by Bunker’s Garden Chapel 480-696-6883.